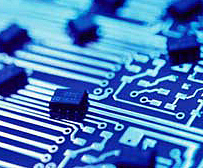 Semiconductors and electronic components are the basic building blocks in today's consumer electronic products. Consumers' demand for better mobile phones, personal computers, DVD players, PDAs, digital cameras, MP3 players, video game consoles, HDTVs, and wireless devices are driving continuous growth in semiconductors and microelectronics. Individual semiconductors and electronic components are sensitive devices that require precision care in handling during various stages of manufacturing. Peak has long worked closely with market leading semiconductor and electronic component manufacturers to design, engineer and produce protective packaging solutions. Peak offers JEDEC Matrix Trays and Tapes and Reels for high-speed testing and assembly of semiconductors and electronic components. Peak's plastic products are designed to comply with industry standards and interface with automated manufacturing equipment and processes, including visual inspection and burn-in (both high and moderate temperature). Peak's Semiconductor products are typically designed to provide mechanical and electrostatic discharge damage protection.